One of the most important and basic decisions you need to make is where you are going to place your storage container. Of course, if you pick a spot that is level, you will save time and energy having to prepare the area before laying a concrete / slab base (however you can now buy wooden shed bases or plastic shed bases to avoid the need of any major DIY skills). If however the place you choose is not level, you must do a thorough job of creating a level plane so that you have a sound base for your shed. What size do you need? Be realistic on the size of the area that is available for your garden building but take in to consideration what you will be using it for, calculate how much material / equipment you need to store in there. You should also consider for the future as well. You don't want to buy one that is so small that you have to cram everything you currently have in there and there is no room for forthcoming purchases. Obtain additional storage space by adding shelving or even loft space but do ensure that the height of the eaves allow enough room for standing space as well as storage. Does the storage shed's entryway allow for easy and accommodating access? 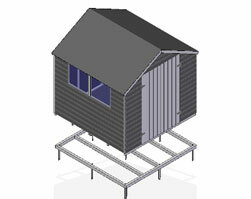 Even the highest quality storage building is useless if it doesn’t accommodate your storage needs. Double-wide doors that measure 64 inches across will offer easy entry for most ride-on lawn mowers and other oversized storage equipment. Once you've established where your container is going to be, you should decide which type of building you prefer. The look and quality of your shed can actually increase the value of your property so consider potential landscaping that will be incorporated. Flowers, climbers and perhaps a trellis are common and attractive ways of improving your garden building. You can also save yourself the expense of having to replace a cheaper unit prematurely, if you choose your garden building wisely. So how do you know if you’re getting the most out of a storage shed for your pennies? By evaluating whether the storage building you have your eye on meets or exceeds the following specifications. When it comes time to picking out the style be sure that you are practical in your decision. After all, it must serve the purpose you are buying it for first, then fit in with the atmosphere where it will be located. With so many to choose from its unlikely that you won't find a style that you like.